2016 started a bit slow, but got on speed soon and ended with a huge amount of events during the last months of 2016. Several new publications were made in 2016. Comicshop Brüsel published a deluxe version of the album Brüsel. There was a German translation “Licht und Schatten” of L'Ombre D'un Homme and an English translation “The Theory of the Grain of Sand” of La Théorie du Grain de Sable. In China two new translations were published: 撒玛利亚的城墙 (Les Murailles de Samaris) and Brüsel. This last one is still hard to find. 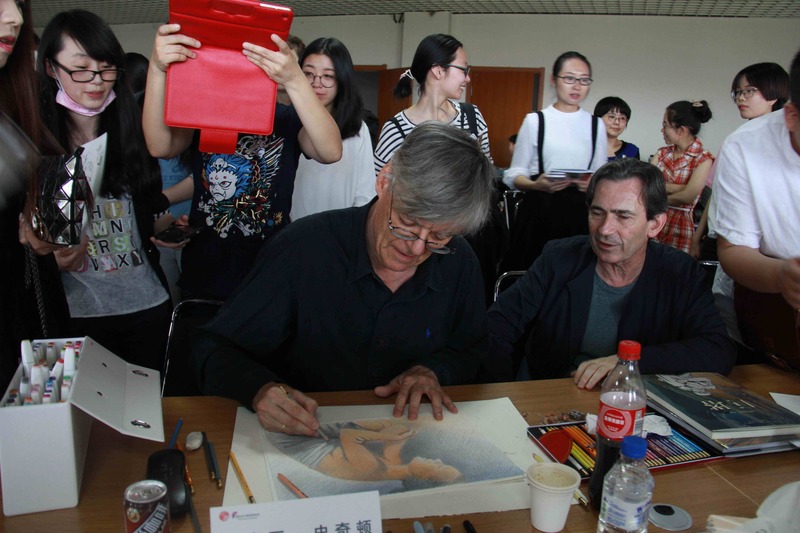 In June 2016 François Schuiten and Benoît Peeters visited China for the Fête des bulles at Central Academy of Fine Arts in Beijing. During these days they had meetings in several cities and places. Benoît Peeters extended his stay in China with a few days while visiting the South of China. In Germany the movie Dolores was released and shown on tv in May 2016. The movie is based on the album “Dolorès” by François Schuiten, Benoît Peeters and Anne Baltus. Peeters and Baltus visited the first viewing of the movie 1). In October 2016 the second part of Revoir Paris, La Nuit des Constellations was published. With a quick Dutch and German translation. Revoir Paris was also published in Japanese Big Comic Magazine. 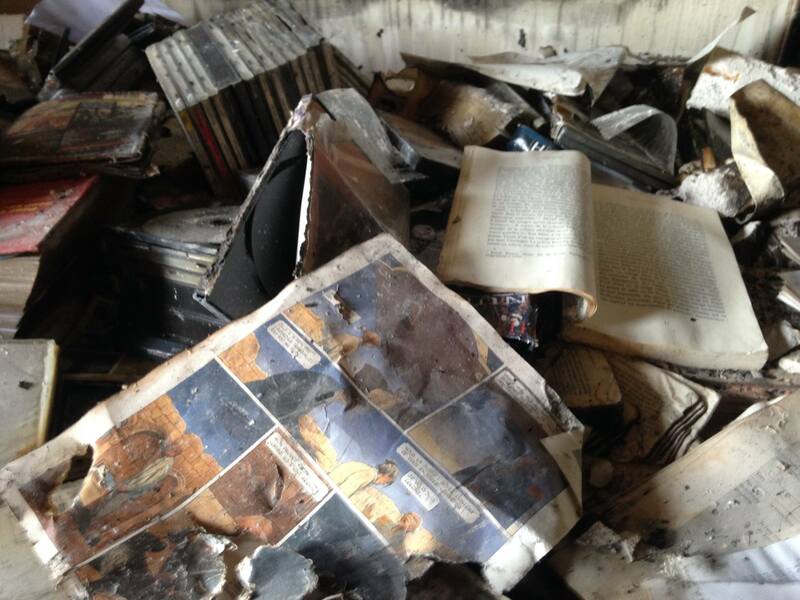 The second album of Revoir Paris was influenced and changed by the attacks on Brussels in March and especially the actions in the neighbourhood of Schuiten and the gas explosion that destroyed the home of Benoît Peeters. While working together on Revoir Paris Schuiten and Peeters also worked on several own projects. Meeting "Raoul Ruiz le magicien"
Discussion "Vies de Charlotte Dufrène"
Schuiten worked on the Scan Pyramids project and joined the exhibition about the project in Lille. 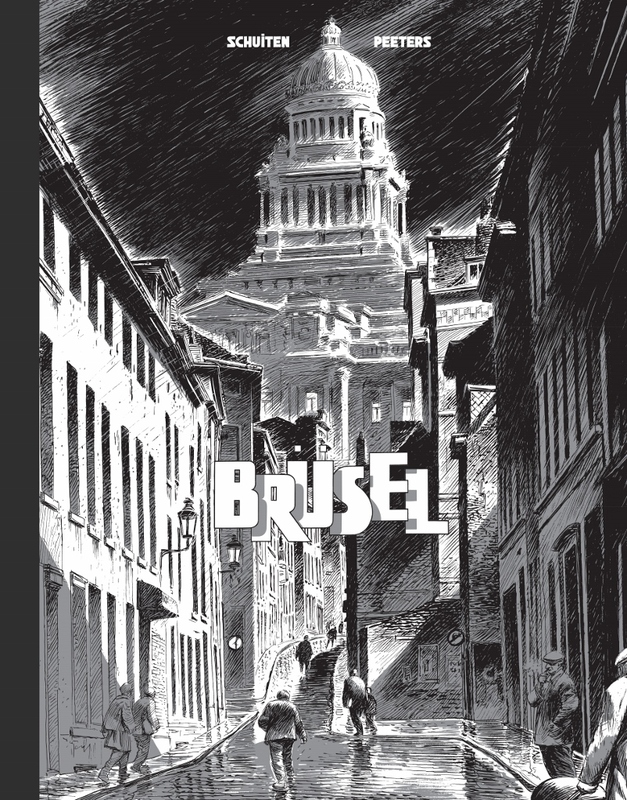 François Schuiten worked on the Blake and Mortimer tribute album with Jaco van Dormael and Thomas Gunzig. He visited "Out of the box" and worked together with Laurent Durieux: he visited his atelier and they prepared their exhibition in Paris. At the end of 2016 François Schuiten and Benoît Peeters could be seen together again very often. Like during their talks with Bruno Letors in Voyages en Utopie - Revoir Paris and Centre Wallonie et Bruxelles. Soon afterwards ”Voyage dans les Cités Obscures“ started in the abbey of Epau. An exhibition about the world of François Schuiten and Benoît Peeters. In corporation with le Département de la Sarthe, le Centre culturel de la Sarthe and la librairie Bulle. 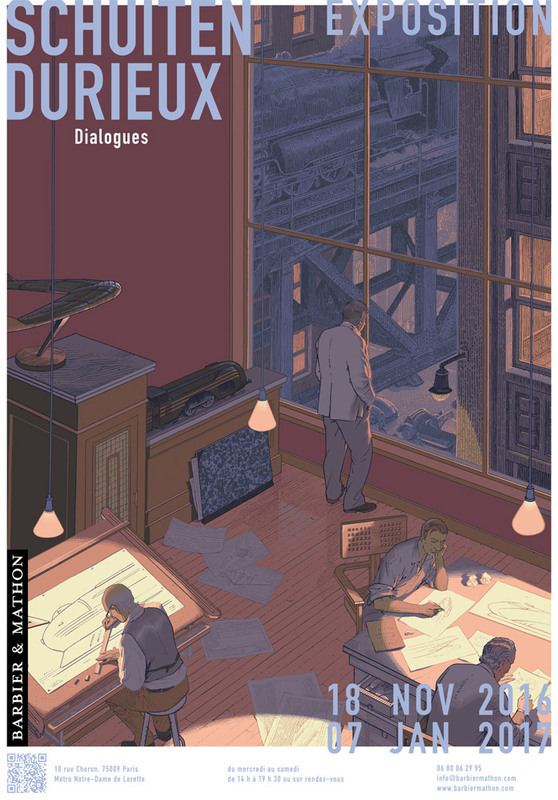 At Gallery Barbier Mathon in Paris Dialogues, an exhibition of work by François Schuiten and Laurent Durieux, started. And finally the Bretagne Express Exhibition started with artwork by Schuiten and Durieux. All exhibitions with accompanied by publications like Machines à colorier, Dialogues and the Portfolio of Abbaye de l'Epau. Atlantic 12 published the announcement posters of all these events as beautiful silkscreens. See the images section. 2016 was also the year of the video. Guillaume Diamant-Berger and Adrien Genoudet made À quatre mains. 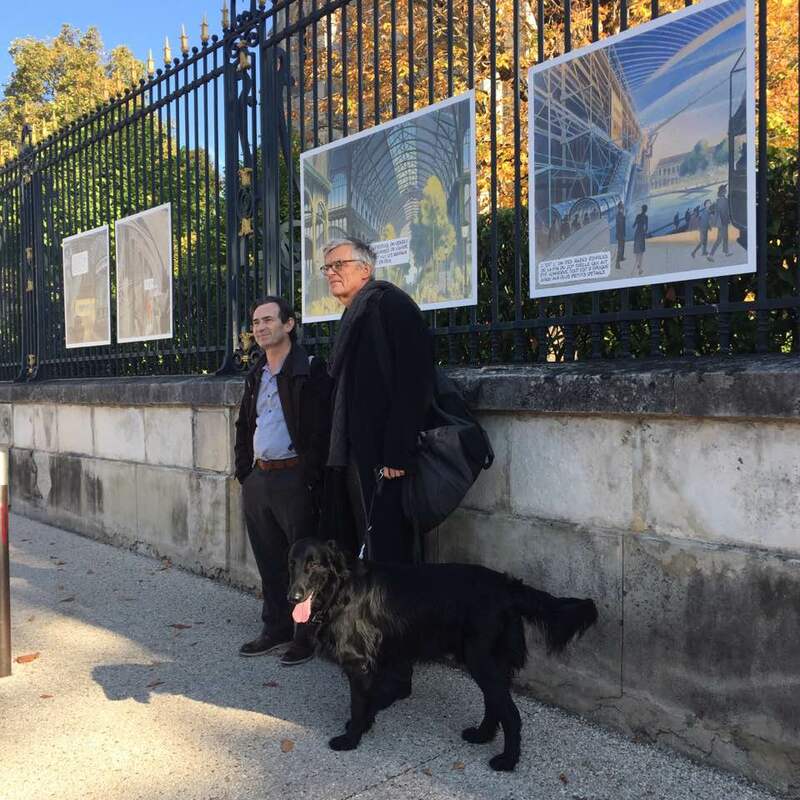 It shows François Schuiten and Benoît Peeters working together on the storyboard of the Revoir Paris, La Nuit des constellations album and discussing the ending. Vladimir Peeters made the video Naissance d’une affiche what reached over 670,000 people on Facebook and was watched 219,600 times. Finally 2016 marked also the 20th anniversary of Altaplana.be and its predecessors at EBBS.net. Where has this Amazing Comic Book Art Been all My Life? À quoi ressemblera Paris en 2156 ? Comment les auteurs de BD trouvent-il l’inspiration? 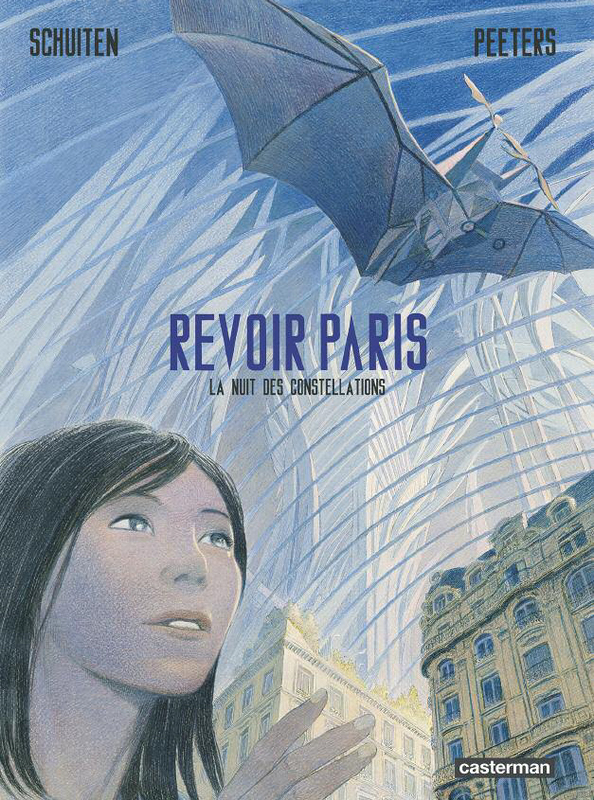 La BD de la semaine: Schuiten et Peeters commentent le tome 2 de "Revoir Paris"
François Schuiten at "Out of the box"
Benoît Peeters joined discussion "Vies de Charlotte Dufrène"